This documentary covers the destruction and chaos of besieged and occupied Aleppo, from the time conflict first came to the city in 2012, all the way through to final liberation in 2016. Showing the full picture of the violence, destroyed lives and carnage visited upon one of the oldest seats of civilisation in the world. “The combat planes belonging to the coalition led by the United States, attacked the army position in Jabal Ghurab, some 150 kilometers [93 miles] east of Palmyra near the border with Iraq,” the commander said. “One serviceman was killed and several others wounded,” he added. According to a Syrian field commander, the sudden US-led coalition air assault occurred after Syrian forces responded to an open fire from three coalition’s vehicles, moving towards positions of governmental forces. Such an open skirmish between Syrian governmental forces and US-led coalition troops reportedly occurred for the first time since the outbreak of the war in Syria. Last week, the Russian reconciliation center reported that the Syrian government troops backed by the Russian Aerospace Forces prevented militants’ audacious breakthrough out of the ​​At Tanf area towards Palmyra. At least eight civilians have lost their lives and several others sustained injuries when the US-led coalition purportedly fighting the Daesh Takfiri terrorist group carried out a string of airstrikes against Syria’s eastern province of Dayr al-Zawr. Local sources, requesting anonymity, told Syria’s official news agency SANA the airborne assaults targeted residential buildings in the al-Shaafah town on Thursday evening. The sources further noted that the airstrikes caused great destruction in targeted areas, forcing many families to leave their homes in the village to escape the heavy bombardment of the US-led coalition military aircraft. Syria’s Ministry of Foreign Affairs and Expatriates, in two separate letters addressed to United Nations Secretary General Antonio Guterres and the rotating President of the UN Security Council Vasily Nebenzya on June 5, condemned the continuing attacks by the US-led coalition against innocent Syrians, and its assaults on the sovereignty, unity and territorial integrity of the conflict-plagued Arab country. The letters further noted that the “illegal” US-led coalition continues to perpetrate massacres against Syrian civilians, leaving scores of people, including elderly people, women and children, dead over the past few days and destroying homes as well as civilian properties and infrastructure in targeted villages. The Syrian foreign ministry added that the US-led coalition is devoid of any international legitimacy, and has bombarded people in the provinces of Hasakah, Raqqah and Dayr al-Zawr after they did not agree to support US-backed Syrian Democratic Forces (SDF) militants. “The United States has organized these militants in a bid to target the positions of the Syrian army, and recapture areas liberated by the Syrian army soldiers and their allies from the menace of terrorism,” the letters pointed out. The Washington Post‘s Jennifer Rubin (6/17/18) epitomized the zero-sum takes of US pundits. In major-paper opinion coverage of the Singapore summit, the people with the most to lose and gain from the summit, the people whose nation was actually being discussed—Koreans—were almost uniformly ignored. Three major US papers—the New York Times, Washington Post and Wall Street Journal—had only one Korean-authored op-ed out of 41 opinion pieces on the subject of the Korean peace talks. The Post had 23 total opinion pieces, the Times had 16 and the Journal four. The only op-ed by a Korean was a pro-summit piece on June 12 by Moon Chung-in, an aide to South Korean President Moon Jae-in. Of the 41 editorials or op-eds only four (9 percent), were broadly positive about the Trump/Kim summit, 29 (70 percent) were negative and eight (21 percent) were mixed or ambiguous. The full list, current as of June 19, is here. As FAIR noted in May (5/7/18), there’s a huge chasm between how recent peace efforts are being received in ostensible US ally South Korea and how they’re being covered in US media. As we noted at the time, polling shows 88 percent of South Koreans in favor of these efforts, while the person spearheading them, President Moon, holds an 86 percent approval rating. But the bulk of US coverage ranged from snide dismissal to outright opposition (FAIR.org, 6/14/18). 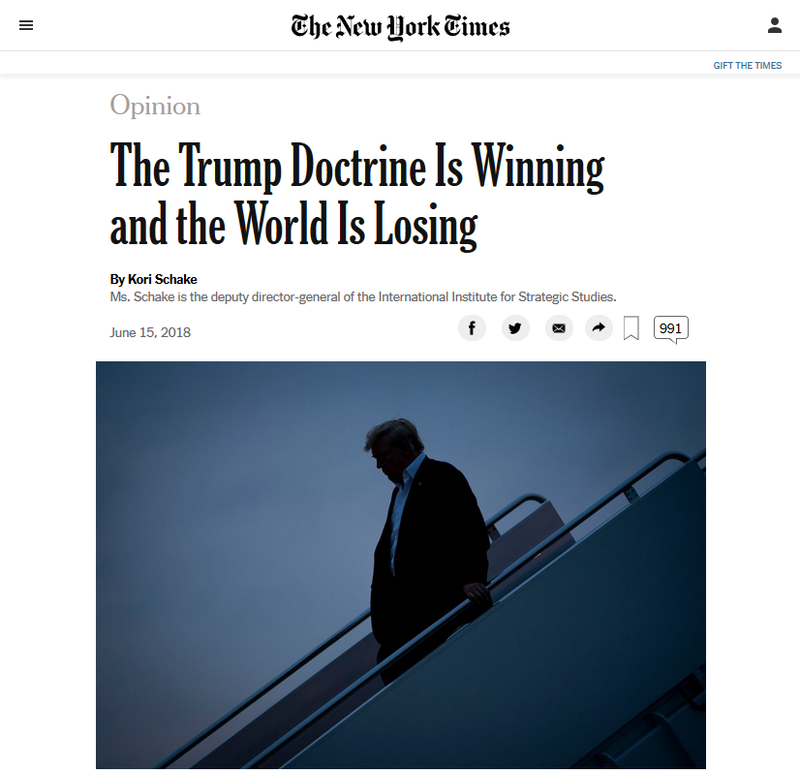 The New York Times published one pro-summit piece, by Victor Cha (6/12/18), and it was a very qualified and conflicted. 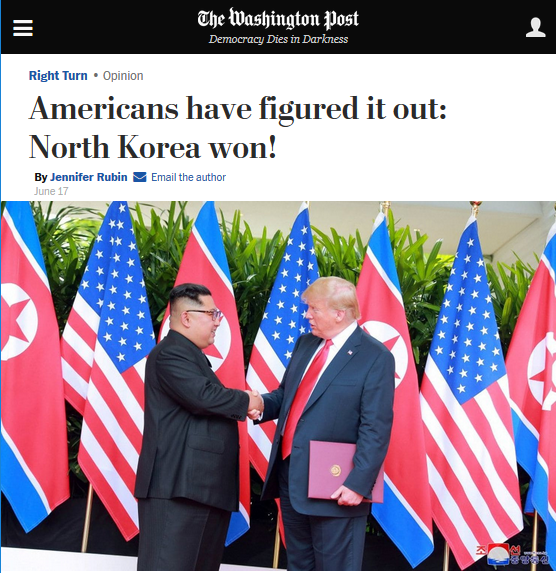 The Washington Post was mostly negative and skeptical, with three exceptions: predictable partisan cheerleading from reliable Trump apologist Marc Thiessen (6/15/17); a measured “wait and see” take from Michael O’Hanlon, a fellow at the Brookings Institution (6/13/18); and the aforementioned piece by President Moon’s aide. The Wall Street Journal’s commentary was uniformly negative. The US media’s reaction to the summit is almost a mirror image of that of the South Korean public: 70 percent of major US papers’ opinion columns disapproved of the summit, whereas 66 percent of South Koreans approved. Eleven percent of South Koreans disapproved, whereas only 9 percent of professional opinion-havers at the Times, Post and Journal thought the summit was a good thing. This raises an important question: Why? What do US pundits know that those with something actually at stake—Koreans—don’t know? A peace treaty is not OK. That should come at the end of the process, because a peace treaty, while it sounds great and could be historic, also undermines the justification of our troops staying South Korea. The “justification” for troops also happens to be the justification for the weapons systems they come with, namely those of CSIS’s major donors Northrop Grumman, Lockheed Martin and Boeing (FAIR.org, 5/8/17). General Mark Carleton-Smith has given his inauguration speech, becoming the new army chief shortly after replacing General Sir Nick Carter, who has moved on to become chief of the defense staff. “The misplaced perception that there is no imminent or existential threat to the UK, and that even if there was, it could only arise with long notice, is wrong,” he said. He also warned against cutting army’s funding, noting that if the country falls behind, the UK might lose its “unquantifiable advantage” over its adversaries. Information earlier surfaced regarding an alleged conversation between the UK prime minister and the UK defense secretary, where Theresa May had suggested that the army needs to enhance its cyber warfare capabilities in order to deter modern threats coming from other states, including Russia. She also reportedly questioned whether the UK had lost its “top tier” status as a military power. Relations between the UK and Russia have been trapped in a downward spiral following the poisoning of former Russian intelligence officer Sergei Skripal and his daughter Yulia in Salisbury, England. The UK declared that the substance used in the attack is similar to the Novichok-class of nerve agents developed by the Soviet Union and accused Russia of organizing the attack, expelling 23 of its diplomats as a punitive measure. Both Skripals later regained consciousness, despite their alleged poisoning with a nerve agent. Moscow has rejected the UK’s accusations, also expelling British diplomats, as well as closing the British Council in Saint-Petersburg. Students at the University of Cambridge protested a talk given by former Israeli prime minister Ehud Olmert at the Judge Business School on Wednesday night, denouncing the former leader as a “war criminal”. According to Varsity, “a poster campaign condemning his [Olmert’s] actions and declaring that he is ‘not welcome in Cambridge’” was launched ahead of the event. Olmert, who was convicted of and jailed for accepting bribes and of obstruction of justice, gave a talk entitled ‘Israel as a start up nation’. An email from the Cambridge Judge Business School inviting staff to attend the event, said: “We would like to keep this event low profile and we are not promoting it across the University”. In a statement published Wednesday, Cambridge University Palestine Society said the invitation to Olmert was “deeply shameful”. “As Prime Minister of Israel from 2006-9, he directly ordered and oversaw the bombardment and massacre of thousands of civillians in Lebanon and Gaza, decried as war crimes by Amnesty International and UNHRC inquiries”, the group said. “Olmert is a war criminal who belongs in the dock of the International Criminal Court at the Hague, not at a canapé-laden reception and discussion in Cambridge”, the statement added. “The title of Olmert’s appearance, ‘Israel as a start up nation’, adds insult to injury, revealing utter contempt on the part of JBS for the millions of Palestinian refugees dispossessed by Israel and denied the right to return to their homes, some of whom study and work at this University”. Unidentified students subsequently plastered the walls of the entrance to the school with posters denouncing Olmert as a war criminal, along with slogans such as ‘Free Palestine’. An Israeli court on Tuesday threw out a confession given by a teenage settler – who cannot be named for legal reasons – in which he admitted his participation in an arson attack on a Palestinian home that killed three people. The court ruled that the confession had been obtained under duress and was inadmissible in court, but that the confession given by primary suspect Amiram Ben-Uliel was valid. Ben-Uliel admitted firebombing the house and his involvement in six other racially motivated attacks targeting Palestinian villages after the “necessary investigations” conducted by Shin Bet police. The unnamed minor had also been accused of taking part in the attack on the Dawabsheh family home on 31 July 2015 in the West Bank village of Duma, which killed toddler Ali Saad Dawabsheh and parents Riham and Saad Dawabsheh. Omar Khamaisi, a lawyer for the family, told MEMO that despite the confession being overruled, the prosecution still had sufficient evidence of the minor’s involvement. The Dawabsheh family has experienced ongoing harassment as the case is heard in court, with another family home in Duma firebombed by settlers last month, causing severe damage. Earlier this week, as the family’s uncle and grandfather Nasr and Hussein Dawabsheh walked out of the courtroom accompanied by MKs Ahmad Tibi and Ayman Odeh, right wingers taunted the family chanting: “Where is Ali? Ali’s dead” and “Ali’s on the grill”. Israel has also refused to pay compensation to the family and five year-old Ahmad, the only surviving member of the attack, who sustained severe burns in the fire. Israeli Defence Minister Avigdor Lieberman said last year that the Palestinian child did not qualify as a “terror victim” and does not hold Israeli citizenship and therefore is not entitled to compensation. The UN has previously expressed concern at the slow progression of the case, with Special Envoy to the Middle East Nikolay Mladenov calling on Israeli authorities “to move swiftly in bringing the perpetrators of this terrible crime to justice”. Cuba Denuclearized in 1962. Why Continue the Embargo? In a time in which President Trump is saying that the U.S. government will lift economic sanctions against North Korea if it “denuclearizes,” why not lift the decades-old U.S. economic embargo against Cuba? After all, Cuba “denuclearized” back in 1962. Why is the U.S. government still punishing the people of Cuba with its brutal economic embargo? In fact, the continued existence of the Cuban embargo might well cause North Korea to ask: If we really do denuclearize, how can we be assured that U.S. officials will really lift their sanctions on North Korea given the continuation of their brutal embargo against Cuba after it denuclearized more than 50 years ago? What is the point of continuing the embargo against Cuba? What is the point of continuing to target the Cuban people with economic misery and impoverishment, on top of the misery and impoverishment they already suffer from living in a socialist economic system? The goal of the Cuba embargo has always been regime change. Ever since Cuban revolutionaries ousted the brutal and corrupt pro-U.S dictator Fulgencio Batista from power in 1959, the CIA and the Pentagon have been hell-bent on doing whatever was necessary to oust the communist regime in Cuba from power and replace it with another pro-U.S. dictatorship. That was the purpose of the CIA’s paramilitary invasion at the Bay of Pigs in Cuba. That was why the Pentagon was constantly exhorting President Kennedy to attack and invade Cuba. That was the goal of the terrorism and sabotage that the CIA inflicted inside Cuba. That was the aim of Operation Northwoods, the Pentagon’s false-flag operation that the Joint Chiefs of Staff unanimously recommended to Kennedy. And that has been the purpose of the brutal economic embargo on Cuba. That was why Cuba invited the Soviet Union to install nuclear weapons in Cuba in 1962 — to deter the Pentagon and the CIA from invading the island or, if an invasion did take place, to be able to defend themselves with nuclear missiles. That is the same reason that North Korea has acquired nuclear weapons — to deter the Pentagon and the CIA from attacking and invading North Korea for the purpose of regime change. Why not just leave Cuba alone? So what if it has a communist regime, just like North Korea does and just like China does? Why does that justify the continued infliction of economic harm on the Cuban people? What business does the U.S. government have in continuing to try to achieve regime change in Cuba? After all, U.S. officials don’t have an embargo against Vietnam, whose communist regime killed some 58,000 American men in the Vietnam War. Why is there an embargo against Cuba, whose regime has never attacked and invaded the United States or even threatened to do so? Through the more than 50 years of the U.S. embargo against Cuba, many Americans have missed a critically important point: The embargo has been not only an attack on the economic well-being of the Cuban people but also on the freedom of the American people. Keep in mind, after all, that when Americans travel to Cuba and spend money there, they are prosecuted, fined, and incarcerated by their own government, not by thy Cuban government. Thus, the perverse irony is that in the name of fighting communism with their economic embargo against Cuba, U.S. officials have been prosecuting, fining, and incarcerating Americans for exercising such fundamental, God-given rights as freedom of travel, economic liberty, private property, and freedom of trade. Why should Americans (and anyone else) be punished tor traveling to wherever they want and spending their own money anywhere and any way they want? US President Donald Trump may sit down for talks with Russia’s President Vladimir Putin during his trip to Europe next month. The British government fears that the two presidents could meet before NATO’s upcoming summit in Brussels and Trump’s official visit to London. “It’s unclear if this meeting is after or before the NATO and UK visit. Obviously after would be better for us,” the Times quoted a Whitehall source as saying. “It adds another dynamic to an already colorful week,” the official added. According to the newspaper, London is alarmed that the possible talks between the US and Russian presidents could have an impact on Trump’s commitment to NATO’s “shared goals” and the outcome of his July 13 visit to Britain. The Times also quoted a Western diplomatic source as saying that if Trump and Putin meet before the July 11 NATO summit in Brussels, this would be viewed as a highly negative development. On Friday, Donald Trump told reporters that it was possible that he would meet Vladimir Putin this summer. Trump, who had two meetings with Putin during last year’s G20 summit in Germany, has shown keen interest in restoring Russia’s place in the international community. At the G7 summit in Quebec earlier this month, he proposed that Russia should be re-admitted to the Group of Eight countries.